Many weddings are planned for summer, but June is THE month to get married. It is hot, but not too hot. It is full of energy and positive feelings. More than that, June was actually named after Greek goddess Juno (or Hera in Roman mythology), the goddess of marriage and a married couple's homes. Marring in her month is believed to bring good luck to the couple. 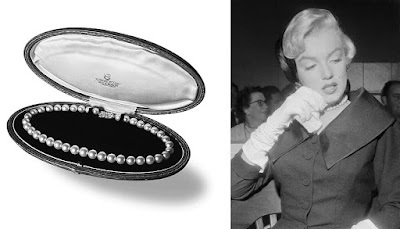 Not by coincidence, June is also the month of pearls. 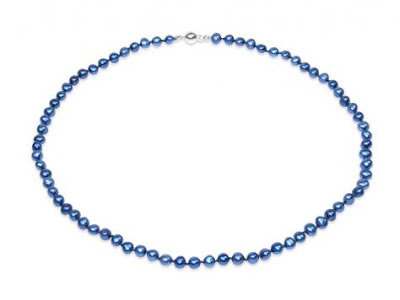 It is said that pearls bring luck to those who were born in June. But most importantly for us, pearls are the ideal adornment for beautiful brides. Shimmery, innocent, and feminine, they had been incorporated in wedding gowns for centuries. 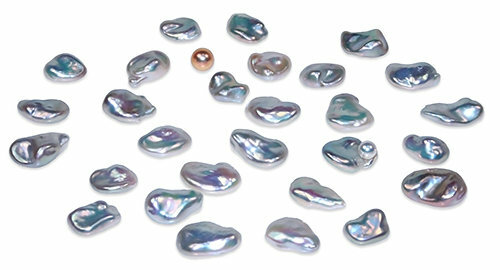 Many women simply cannot imagine their bridal accessories to be made of other stones than pearls. However, when it comes to choosing jewellery that matches the best our gowns, we sometimes get stuck in picking the most flattering type of jewels to complement the dress of our dreams. Immerse yourself in nostalgia for simpler life, innocent and untroubled. An overwhelming warm feeling evoked by golden and copper overtones of paintings depicting flourishing and rustic Golden Age or idyllic Arcadia is taking over our dreams. Inspired by utopian images from the past, we have designed this pearl necklace to remind ourselves of the beauty of life. Soft and golden tones of ninety-one shimmery and round freshwater pearls symbolize the ripeness of summer apples picked from the tree. Do you still remember their warm sweetness taking over your senses? Eight pink gold-plated silver rings are the embodiment of the circle of life. Do you still recall the gentle touch of the morning on your skin? Her name is Alicia. A noble but dreamy girl; radiant, gentle, and truthful. Immerse yourself in nostalgia for simpler life, innocent and untroubled. 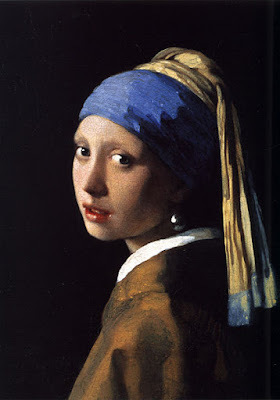 One of the most famous paintings featuring pearl jewellery has been created in 1665 by Johannes Vermeer. It is sometimes referred to as the “Mona Lisa of the North”. Why the paining of an unknown girl has been so captivating to generations of art lovers? The pearl, a few brush strokes, is the focal point of the paining. It accentuates the movement of the girl’s head and evokes the evanescence of the captured moment. The painting can be viewed in Royal Picture Gallery Mauritshuis in The Hague. A more scientific interpretation of the painting can be found here. 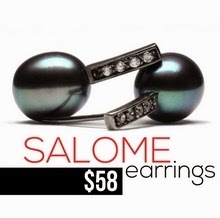 What is more appealing than a beautiful woman wearing beautiful jewellery is? In celebration of the London’s Bond Street Culture & Heritage Week, Mikimoto is displaying one of its most famous jewels- a strand of pearls that once belonged to Marilyn Monroe. Only two months ago, one of the pearl treasures of China changed its proud owner. The Emperor's Eastern Pearl Court Necklace (Chaozhu), incorporating 108 flawless natural freshwater pearls, gold, coral, and other gemstones, was sold for a staggering price of US$ 8.7 million at Sotheby’s auction in Hong Kong. Truly a world breaking record! 134 cm long and with pearls measuring from 9.6 to 10.65 mm, this necklace belonged to the emperor Yongzheng from the 18th century Qing Dynasty. 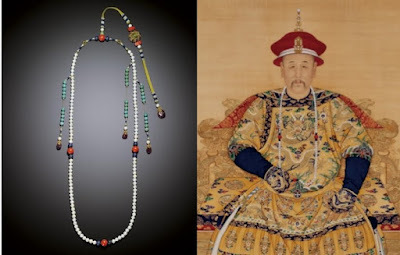 The pearl court necklace, incorporating a Buddhist rosary design, had been introduced as a part of the official ceremonial dress by the Qing Dynasty in 1636. The latest movie by Tim Burton, “Alice in Wonderland”, brought us back to our wonderful childhood years. It is a beautiful story about female empowerment and regaining our “muchness” as the Mad Hatter would put it. When we grow older, we often become scared of life situations and lose our ability to experience our emotions to the full. The adventures of Alice give us hints on reinventing your own self-esteem and taking the courage to do what we really want and need to. In addition to teaching us a profound philosophical lesson, it also gives us a real tutorial to the fairy-tale romantic style. The embodiment of it, the White Queen, is eccentric, dramatic, and powerful, yet committed to harm no living thing. Played by Anne Hathaway, the White Queen sways through the screen in gorgeous white gown adorned with pearls. Her dress is intricately detailed without being overly indulgent, and her pearls complement it beautifully by giving it even more ethereal, dreamy, and pure look.